Shoes are one of the staples of the skateboarding culture. In fact, skateboarding has made a particular type of shoes so popular that their popularity has skyrocketed into a couple of different cultures, such as the streetwear culture. But the main reason why skaters use special skating shoes, is simply because they put them through a lot of abuse. The life of the average skate shoe can be brutal, as there are countless stunts which delegate heavy impact on the shoe, and the grip tape constantly grinds away its exterior. When it comes to buying sneakers skate shoes come in two basic styles (vulcanised and cupsoles) and one of them (cupsoles) leans towards heavier defense against impact when coming down from an aerial, while the other one (vulcanised) offers better board control, allowing you to perform more technical tricks. 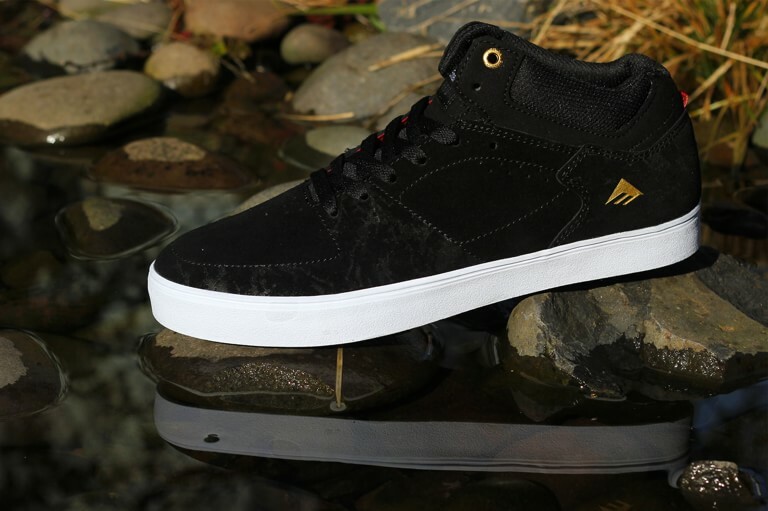 Vulcanised skate shoes are similar to casual shoes, as they’re slim, lightweight, flexible and feature thinner soles. All of these properties are ideal for maneuverability and board control when performing technical flip tricks. However, what these boots offer in control, lack in cushioning, so skaters who suffer from constant heel bruising might not be comfortable wearing them. Cupsoles, on the other hand, are ideal for skaters who prefer flying down stairs and bucking themselves off large drop-offs, and as a result need to protect themselves against severe impact. Bulky shoes with heavily padded tongues and thicker soles provide the much needed cushioning for extra support from the arduous riding style, but sacrifice the maneuverability and control of vulcanised shoes. When buying sneakers skate shoes offer protection in the form of a heel collar, dual heel cushioning and midsoles. Midsoles are typically lightweight and flexible EVA foam, made of thousands gas bubbles which release on impact then refill when the foot leaves the ground. PU foam is also a popular alternative to EVA, which is heavier and denser, but doesn’t break down as fast as EVA. A heel collar is the thick padding around the heel which traps the foot in an attempt to prevent losing the shoe when performing tricks. Dual heel cushioning is the extra heel cushion which offers extra heel protection. G2 cushioning is the most common type of dual cushioning on vulcanised shoes, as it offers more impact resistance in thin-soled shoes. That being said, skate shoes should be durable enough to withstand the abuse you put them through when performing tricks and maneuvers, and they should offer optimum protection for your feet, especially your heels.